Hey ! Sorry for the sporadic posts off late, I've been busy with other things while looking out for new ideas to share.... Here's one I hope you'll enjoy, and if it inspires you to do the same, I'd be happy to hear from you ! 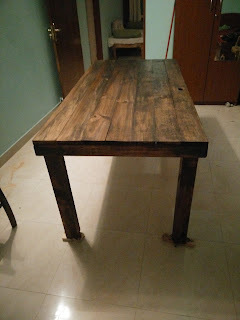 I have a soft corner for antique looking furniture and since I love having guests over, I'd been looking for a rustic table for quite some time. Unfortunately, the ones that suited my taste were very expensive, even second hand. 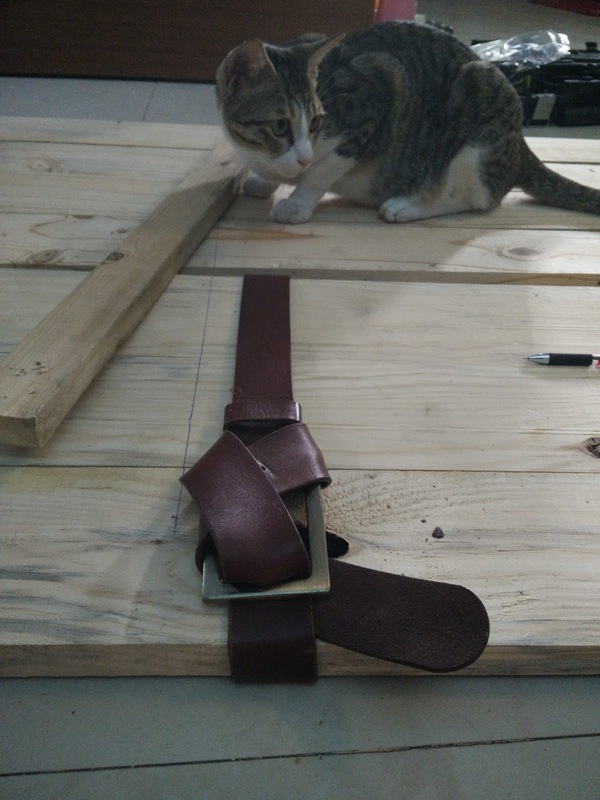 Since I didn't find it worth buying 'ready made', I decided to make my own. After checking out a few DIY dining table videos on Youtube I was ready to get started. 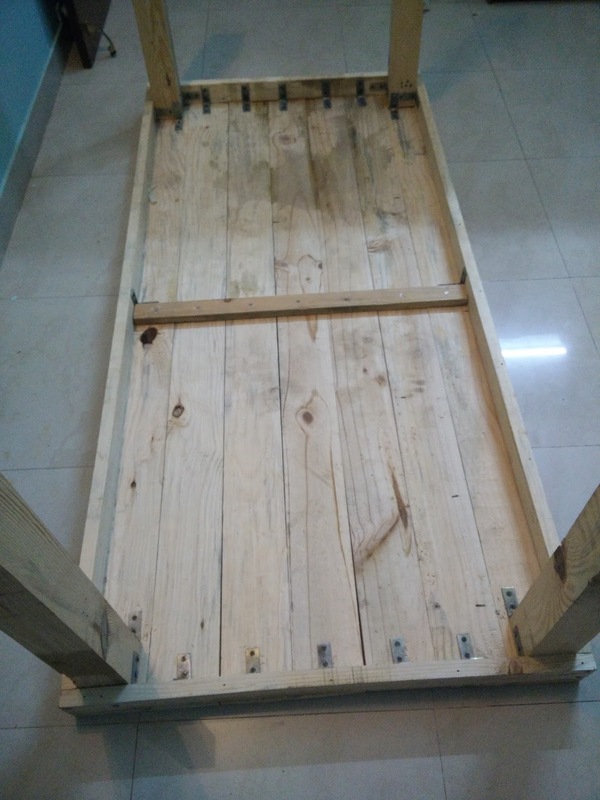 For the Bangaloreans readers, I got the reclaimed pine wood at the Bamboo Bazaar in Shivajinagar for 36 rs/kg, including the cutting and planing. I wanted a comfortable six seater, that could be extended to an eight seater with two additional chairs on the ends, so I took boards that amounted to a 6*3 feet surface, to which I added the wood for the frame and the strong feet to maximise the stability. I got some wood screws at the hardware store, as well as a wood saw, file, and sand paper because the cutting they'd done at Bamboo bazar was very approximate, to say the least. 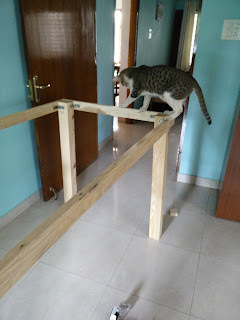 I also bought some corner clamps to fix the top boards to the frame from underneath, because I didn't want any screws to be visible. Last but not least, the visible iron corners are from Thar, a furniture shop right opposite EGL (Domlur), I love the antique touch they add! 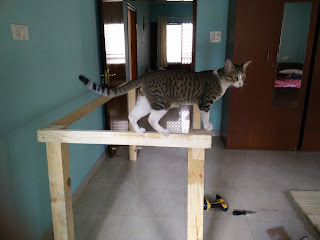 I started by fixing the frame and feet together with screws and after the base was assembled and approved by the cat, I could move on to the top surface. 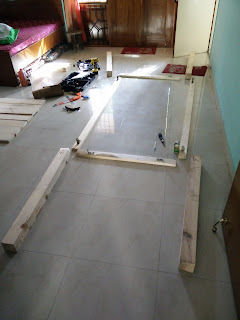 When I was ready to fix it all together I placed the frame, upside down, on top of the assembled boards and screwed each board to the frame using the metallic corners. I didn't have a C-clamp then, but I'd higly recommend you to get one for this step. Instead, I used my UPS battery for weight, again to minimise the gaps between the top board and frame. This monster was so heavy it was nearly impossible to maneuver, yet the stubborn girl that I am managed it somehow, but honestly, never again ! So I can't insist enough, get a C-clamp !! 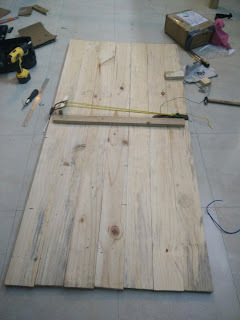 If you have one you'll have to put everything right side up and screw from under the table because you can't fix the clamp if it's on the floor like here. Once it was all steady and strong on it's four feet, I filed the edges to make sure everything was aligned and sanded the entire table. Now this is what I call serious arm workout, I felt it for days ! I then stained it for a darker finish using Danish oil black walnut. This protects the wood as well and nourishes it deeply. Once it had sinked in for about an hour, I wiped off the excess oil with a dry cloth and let it dry overnight. Hi Amelie - It looks absolutely fabulous. Can you help demystify some aspects of your creation ? 2. 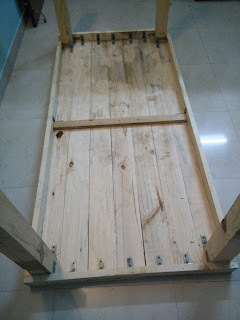 Did you join the boards on the sides before you attached them to the central board ? 3. What did you use to stain the planks ? 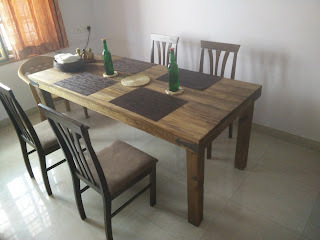 Love the table. It looks sturdy , and neat. 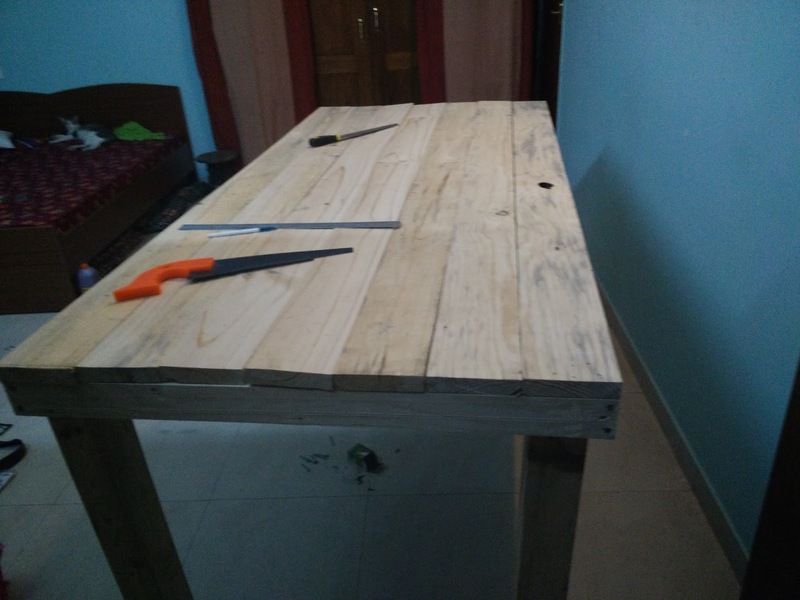 I have always been interested in DIY wood working, but never had the confidence to get started. 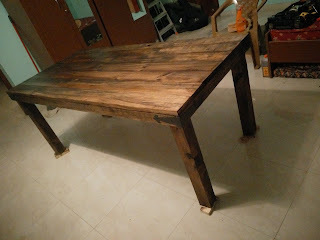 Love your blog and your neat DIYs. Wow, amazing. The post really very impressive content and the images. Thank you for the sharing of this post.